This is a set of two maps. Each map measures 40” x 28”. The Canada Map features capitals and provincial boundaries. 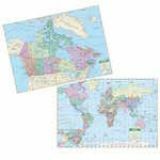 The World Map displays the Mercator projection and offers complete coverage, including an inset of Europe. Rolled Maps of Canada and the World are the perfect compliment for students of all ages. 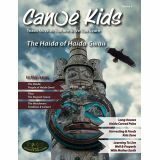 Canoe Kids Volume 2 Haida is a family book for kids all ages. This book focuses on the Haida Nation of Haida Gwaii. In 165 pages the reader is introduced to the Haida people. The articles included in the Haida issue celebrate the oceans, the soundscape, harvesting, history and culture, totem poles, canoes, longhouses, food and recipes, transportation, the Haida Gwaii Watchmen Program, the bent box, repatriating the name for the territory, the Peace Potlatch, the language, totem pole raising, archaeological sites, the Inside Passage, and book reviews. Throughout the text the editor has included colourful photographs of the geography, people, and animals living in Haida Gwaii. Canoe Kids stresses the importance of traditional knowledge and the importance of the environment for all of Mother Earth's children and the Haida issue acknowledges this connection in keeping Turtle Island vibrant and thriving for all the faces yet to come. Highly recommended. De Temps Immémorial propose un survol honnête et actualisé de l'histoire des Premières Nations côtières, du pré-contact au présent. La culture des côtiers était extrêmement complexe. Bien qu'il y ait beaucoup de similitudes, il y avait aussi beaucoup de différences entre les groupes partageant la richesse de leur environnement vital. Depuis sa création, le Comité directeur sur l'éducation des Premières Nations de la Colombie-Britannique a recommandé «De tout temps, un texte authentique conforme aux normes provinciales et reflétant les connaissances et les perspectives des Premiers Peuples de manière respective». Niveaux : 3ième – 8ième. 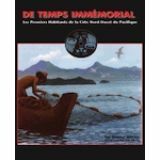 From Time Immemorial provides an honest and up-to-date survey of the history of the coastal First Nations from pre-contact to the present. The culture of the coastal people was highly complex. Although there were many similarities, there were also many differences among the groups who shared the wealth of their life-sustaining environment. From Time Immemorial has been recommended by the First Nations Education Steering Committee of BC as an “authentic First Peoples text that meets provincial standards and reflects First Peoples knowledge and perspectives in a respective way.” Grades 3-8. 40" wide 28" high. Features country names and a colourful icon for each country. Ages 6 to 12. 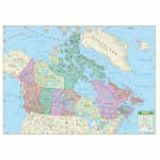 The Canada Wall Map is a political/physical Wall Map that is laminated. Measures 40” x 28”. Includes Canada, Iceland, Greenland, and portions of the USA. Identifies capitals, cities, rivers, national parks, monuments, and points of interest. Shows lines of latitude and longitude. Province boundaries identified with different colors. Includes International Date Line and time zones. Ages 6-adult. This map is laminated. 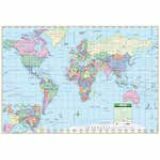 The World Political paper rolled map by Kappa Map Group measures 40″ W x 28″ H. Accurate, authoritative, the map includes an inset of Europe, Tropic, Equator, and Prime Meridian lines. 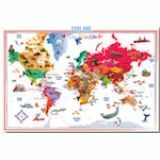 Included are oceans and seas, rivers and lakes, continents, countries, capitals and major cities, International Date Line and Time Zone, and the lines of Latitude and Longitude. Ages 6-adult. The Canada Wall Map is a political/physical Wall Map. Measures 40” x 28”. Includes Canada, Iceland, Greenland, and portions of the USA. Identifies capitals, cities, rivers, national parks, monuments, and points of interest. Shows lines of latitude and longitude. Province boundaries identified with different colors. Includes International Date Line and time zones. Ages 6-adult. 40" wide 28" high. Accurate and up-to-date political map of the world. Shows capitals and country boundaries as well as International Date Line and time zones. Suitable for wall mounting. Ages 6 to adult. 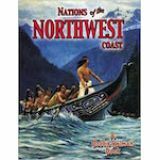 The northwest coast of the Pacific Ocean has been home to many Native nations for thousands of years. The waters, mountains, and forests of this isolated region provided food and shelter for groups such as the Tlingit, the Haida, and the Kwakiutl. 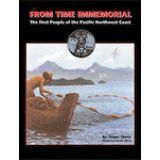 Topics covered in Nations of the Northwest Coast include: • the distinct customs, cultures, and beliefs of the various nations • dwellings used in different seasons and locales • fishing and the use of coastal plants and animals • traditional handicrafts, including carving and weaving • the organization of families, clans, and moieties • the impact of the arrival of the Europeans. Gr 3-6, 32 pages. 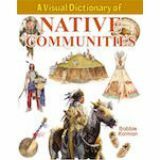 Many of the foods we eat, the tools we use, the games we play, and even the ideas in which we believe, originated with North American Native peoples. 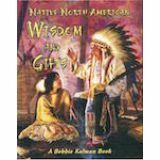 Beautiful images and easy-to-follow text help young readers discover the Native traditions and practices that were adopted by European explorers, North American settlers, and other people around the world. The topics include Native hunting and fishing practices that are still in use today, innovations in medicine and health that helped many people survive in North America, how Native beliefs of equality and democracy were adopted by North American governments. Gr 3-6.